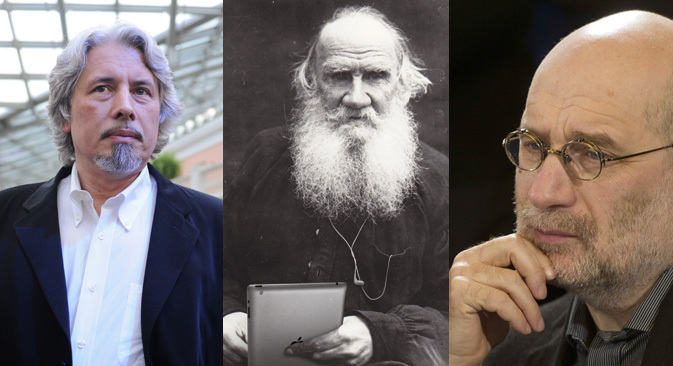 Russia's most memorable books and literary events of 2013 examine the passage of history. The year's three most acclaimed novels are explorations of the country's past and future, while literary projects focus on preserving cultural heritage and the fate of Russian literature. "Telluria," a long-awaited novel from postmodernist Vladimir Sorokin, is among the most talked-about sensations of the year. Sorokin's life as a writer can be divided into two eras. He earned his notoriety in the 1980s, when his conceptual prose was a parody montage of the Soviet regime and its accompanying bourgeois lifestyle. His work was illustrated by flamboyant descriptions of carnal pleasures and perversities. In the late 1990s, he switched from this “Sots Art” style—a humorous juxtaposition of elevated Soviet propaganda coupled with a dose of harsh reality. He began instead to portray the horrors of an alternative, fictional history. What would life have been like, had mother Russia taken a different turn? These visions are elaborate and nightmarish with varying degrees of phantasmagoria. "Telluria" is another dystopia in this same vein. The book comprises 50 short stories united by a shared nightmare: Russia has broken down into numerous small pieces and all of these feudal fiefdoms are ruled by a magical metal, tellur, which is mined in Siberia and transported to Moscow. The absurdist satire offers a bizarre reflection of Russia's reality; the novel also fulfills the author’s literary ambition to pay tribute to renowned writers: In his 50 stories/chapters, Sorokin parodies the writing style of famous authors from Dan Brown to the great James Joyce. Sorokin's rival for fame outside Russia, Victor Pelevin, author of “Omon Ra,” and “Home Zapiens,” published a novel this year, called "Batman Apollo." This surreal world is governed by vampires, immortal beings served by “chaldeans,” the people seen on TV every day. The third most significant novel of the year is Evgeniy Vodolazkin's "Lavr"(Laurus). The work was nominated for three of the most prestigious literary prizes, the Big Book, Natsbest and the Russian Booker—ultimately winning the Big Book. Unlike the first two authors, Vodolazkin creates a fantasy from the Russian past, a narrative about a 15th-century physician, who has the gift of healing. Grigory Chkhartishvili, a historian and a Japanese scholar by education, is much better known in the United States by his pseudonym Boris Akunin, and his thrilling and popular detective novels, “The Winter Queen,” “The Turkish Gambit,” and “Special Assignments,” as well as his recent “He-Lover of Death.” The author of has embarked on a new and ambitious project, "A History of the Russian State," a series of adventure novellas inspired by Russian history. The first volume in the "History of the Russian State" series was published in Russia this fall and instantly became the subject of lively debate between Akunin acolytes and Russian historians. The year 2013 also saw the launch of a history and literature project called "All of Tolstoy in One Click," organized jointly by the state museum of Leo Tolstoy, the Yasnaya Polyana museum and the software company ABBYY. The purpose of the project is to convert 90 volumes of the writer's complete works (including journals and letters) online and for free. Great-great-granddaughter of Tolstoy, initiator of the project, Fekla Tolstaya says: "We were sure that some people would undertake moderate efforts to help us in certain things, but that we would have to do most of the work ourselves. You can imagine our surprise when the volunteers managed to get the work done in just two weeks — work that otherwise would have taken years to complete". Literature and the authorities: A future together or apart? On November 21, 2013, Russian President Vladimir Putin had a meeting with some 500 Russian writers, poets and publishers. The meeting was a first in Russia's post-Soviet history and included postmodernists as well as descendants of the masters: Dostoevsky, Lermontov and Tolstoy. President Putin said that the authorities and writers have a shared goal: "to attract society's attention to national literature, and to make Russian literature and language a powerful factor in Russia's influence on the development of ideas throughout the world." Putin proposed a number of measures toward achieving that objective: a national program to support reading; making 2015 the year of Russian literature; and plans for a long-term program of financial support for Russian authors. However, the state would cooperate only with a single writers' organization, a Russian Literary Assembly, which the president invited writers to create. In 2013, English-language readers got to know one of Russia’s great experimental poets, Kirill Medvedev. Brooklyn-based Ugly Duckling Presse released the collection by Medvedev, an opposition activist, musician and poet. Titled "It's No Good," the book is one of the most significant collections of Russian poetry to come out of the early 2000s. Known in Russia as a Charles Bukowski translator, Medvedev has protested against the commercialization of art. He currently rejects the idea of copyright, and the colophon of his new book reads: "Copyright denied by Kirill Medvedev." This first translation of Medvedev's works into English has received rave and expansive reviews in The New York Observer, The New York Times and The Paris Review.